Subject description: UPDATE - PCB run planned! Last year, Fonik and I teamed up and turned the perfboard builds into a couple of PCBs. Matthias did his usual beautiful work on the layout, and helped a lot in the final design stages - cheers mate! 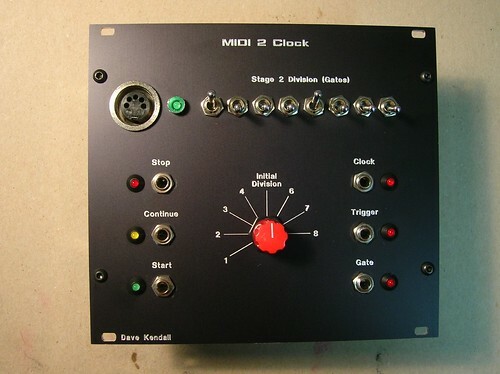 The MIDI2CLOCK (M2C) takes a MIDI input, and outputs 24PPQN CLOCKS, START, CONTINUE and STOP pulses. These can be +5V or +10v by installing links or pairs of resistors. There is also an onboard 2-stage divider network with GATE and TRIGGER outputs, that allows different time signatures, pulse divisions and pulse widths to be set up, using just a rotary switch and 8 SPST changeover toggle switches. No menus or LCDs, or any of that malarkey. The circuit has been tested operating from 1 BPM to 250 BPM, and will track tempo changes smoothly. The gate length is proportional to the tempo, so slower tempi give longer gate lengths. 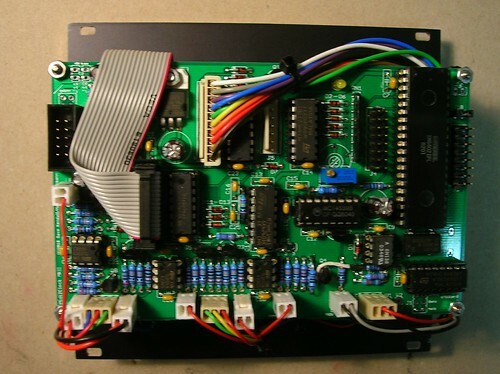 There are LED indicators for the various outputs, and a MIDI receive LED that lights when any MIDI signal is present at the circuit's MIDI input. There are pin headers too for the transmit section of the main processor (CV to MIDI). It is not used in the basic design, but is there for those who wish to experiment with it. Additional circuitry will need to be added in order to use this function. There are no programmable ICs used, and no calibration is needed, so it can be simply soldered up and is then ready to go. All components used are in current production as of may 2nd 2011, with only one slightly unusual IC, which is still being manufactured, and is stocked by Digikey, Debco.com, Jameco, Farnell and others. 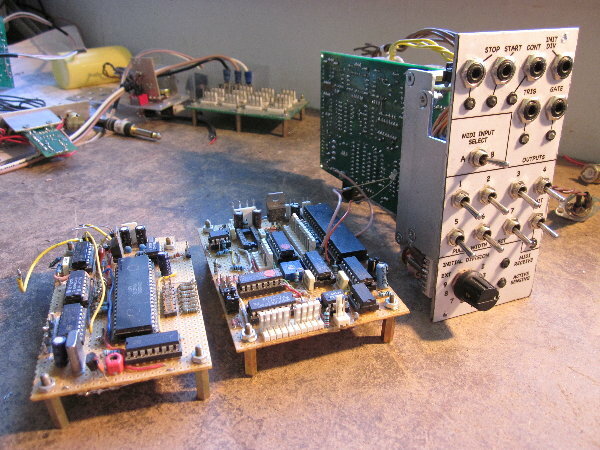 The bottom one shows the MK1 and MK2 prototypes on perfboard. will you be releasing the schematic ? A pnp home etch job would be fine but if there were to be a run of boards it would be even better and rightly should attract a lot of interest. here are some pics of my built. i decided to spend more front panel estate to keep the module shallow for my new portable suitcase rig. 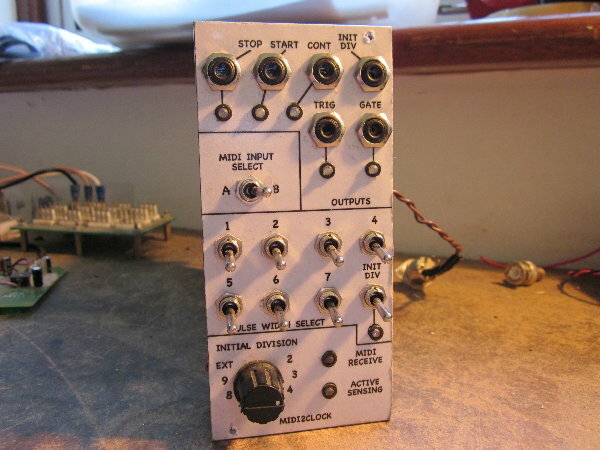 Yesterday i saw a picture of your panel on the Matrixsynth blog, and i googled 'Dave Kendall midi clock' with no results. 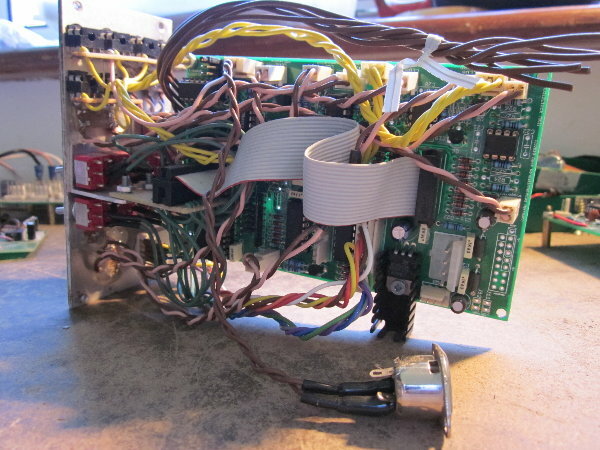 I am glad to see this thread here, i would be very interested in case of a run of pcbs for this project, even if i am not sure what is the exact function of the 8 switches and the rotary one.. i guess two stages of clock division starting from midi's 24ppqn? Anyway, i was looking to a midi module only for clock and this would be perfect! yep. you have one initial divider stage. the output of this initial divider is then routed to the 2nd stage, allowing you to set patterns/divisions/PW etc. think of the 2nd stage divider as of a simple gate sequencer. maybe dave could chime in? he could explane it much better than me, i bet. i even fear that my labeling of the initial division rotary switch is missleading. A gate sequencer, great! I see some difference between the layouts, like an external cv i guess for selecting the initial division of midi clock.. mm! very interesting! And i see a switch for selecting midi in a or b (not easy to think a practical use for that for me.. maybe i didn't understood his function.. is it just a switch to select from two midi clock sources?). Bit of a long post, but I'll try to explain how the M2C works. It may seem complicated, but when you actually use it, it's dead simple. Diablojoy - I guess if a PCB run happens, the schematics will be released at the end of the first run, along with a BOM and build/user notes. I'm working on the latter at the moment, though it will take a while due to work pressure. The second divider stage sets the division *and* pulse width from the GATE out jack, and is controlled by the toggles. It is indeed a gate sequencer, although I originally thought of it as an 8-input OR gate. For setting pulse widths and divisions, lets set the INITIAL DIVISION to 3. With Toggles 1,3,5 and 7 ON, you would get 16 beats to the bar from the GATE and TRIGGER out jacks. With 1 and 5 ON, you get 8 beats and so on. With only toggle 1 ON, you get 4 beats to the bar. If toggle 2 is also ON, the pulse length doubles. With the first 7 toggles ON, you get 4 beats to the bar, but with a pulse length that is *nearly* the whole length of a beat. This is a function of the circuit design, but I think it is a good thing, as, if you trigger an envelope from the GATE out, the gate goes low quickly at the end of the beat, and the envelope is re-triggered at the start of the next beat. With the INITIAL DIVISION set to divide by 6, you get the same behaviour as above, but the maximum number of beats is now 16, and at the slowest setting (only toggle 1 ON) you get just 2 beats to the bar in 4/4. If the INITIAL DIVISION is set to divide by 4 or 8, you get a 3/4 meter. You can have a lot of fun by setting random patterns of the toggles - you get odd rhythms with pulses of different lengths. These can be switched ON and OFF while the thing is running, and it won't affect the sync. Switching the initial division while the sequencer is running gives much more unpredictable results. The other odd numbered divisions in the initial divider (divide by 5, 7 etc.) are there just for fun - a simple build could just have divide by 3 or 4. The EXT position on the rotary was a position left for expansion, where the INITIAL DIVISION could also be gate selected. I have some ideas on how to achieve this, it wouldn't be too hard. A possible expansion board could combine a 2nd gate controlled secondary stage, possibly a gate controlled initial stage, and DIN SYNC, which should be easy enough to implement. Finally, Tommi, you're right again - the MIDI input select switches between two physical MIDI inputs. I always try and run MIDI clocks, and definitely MTC, on its own down a separate MIDI cable from NOTE and other information. MIDI protocol will allow MIDI clocks to be sent in the middle of *any* midi messages, including SYS-EX, so in practice, they can end up delaying other information like note-ons, particularly at faster tempi. There are lots of the little buggers flying around, and MIDI still runs at the same baud rate, so there is less room for notes etc. to be transmitted. I totally recommend using a separate cable for MIDI clocks. These days, multi output MIDI interfaces for computers are cheap enough, so dedicating one from the 8 for clocks, helps a lot to tighten things up. Hence, the select switch - I can either feed the M2C from the dedicated clock line, or another line if needed. Hope this has helped a bit to explain. It *is* easy to use when you have it in your hand, and you can just switch away until you have something you like. I'll try to get a quick audio demo or two up, to show what it can do. Thanks for taking your time for explaining your project in the details. This project will be great and of course i 'll buy a pcb when/if available. The toggle control thing is an original feature. The start, stop and continue pulses outputs aren't implemented in any m2cv commercial module as i know, but they are exactly what i was looking for. The Doepfer A-190, wich is the module i am using for synchronising my computer with my modular, is outputting a steady hi when stopped and steady low when running, so i had to use a cgs slope detector to translate these in single pulses to reset my seqencers. With your module i 'd have all these features (and more) all in one. Tombola's design over at Muff's is very cool. Getting swing features in there is a first I think, and it deserves to do very well. I hope it does. The M2C is a bit of a different beastie, with a different approach. It's really more of a core board for MIDI to modular stuff. I'm hoping if there's a PCB run, people will come up with ideas and designs for expander circuits, as they can be added without affecting the basic functions. There is an onboard LM7805 +5V regulator with room for a heatsink, and Doepfer and MOTM format power headers. There is also a power out connector with -15V, +15V +5V and GND on a 4-pin 0.100 header. It should also work fine on ±12V with no component changes. here's hoping for a board run then, definitely in for that if it happens. Great stuff! Is it easier to make if all I need is a basic pulse for using with cmos circuits? I'm going to have to build something to eventually that does that. Is it still as complex if that's all I need? What would I be looking at for cost for the components? Is it easier to make if all I need is a basic pulse for using with cmos circuits? Yes. If you leave out the divider stages, the output buffers and the toggles and rotary switch, the wiring is drastically reduced. It cuts it down to the main processor section, which would be 7 ICs plus a voltage regulator, and a few caps, resistors and 1N4148 or 1N914 diodes. There are pads for a pin header that carries the 24PPQN clocks, as well as other midi messages. Some unused input pins on one CMOS IC would need to be tied to ground, as per good practice. I reckon the components will come to around $15 - $20 US without the divider stages. A full build would add 8 SPST toggles, a rotary switch, 6 jacks or bananas, 3 x TL072s and a pair of common CMOS ICs. Not all the headers are vital for the circuit to work, and they could be added later if they are needed. Many or all of the LED indicators could be omitted, although the MIDI Receive LED would be well worth installing. There are a total of 8 indicators, each with a 2N3904 or equivalent transistor, a resistor and a LED. Only 3 resistors really ought to be metal film ones, for stability - they don't need to be very close tolerance. It would probably be OK with carbon 5% ones, but I haven't tried that. You could still have access to the divider stages without the toggles and rotary, if all the ICs are installed. 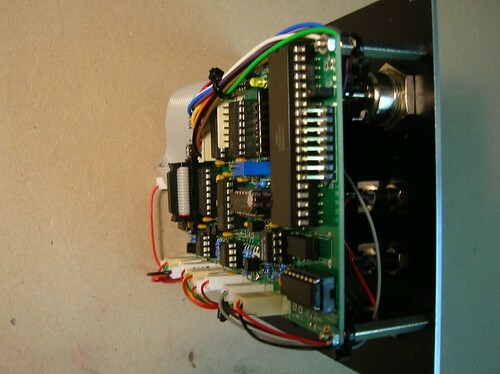 That way you could remotely control the divider stages using other cmos circuits. In terms of how much the PC board would cost, that's up to Matthias. It will also probably depend on how many people are interested in a PCB. We'd need a few people in there to make it viable. nice one! I´m in for a pcb if it comes to a run. I'm in for a PCB. Would I need a schematic or instructions to go with it, or will everything be apparent by the labels on the PCB? I'm new to this, and I haven't worked with a printed bored yet - just my own creations on blank circuit board. That's why I'm interested in the CMOS part - because I'm still working with very basic circuits, but I think it would be great if I could sync them up to my computer and other synths. I'd be in for one. Cynosure - there are labels on the board for each component. When the boards go out, the schematic, board layout picture and BOM (bill of materials) listing all parts and possible substitutes will be published here on electro-music for reference. There will also be a build guide, showing any optional parts that can be left out. This will also have a basic connections guide with diagrams. How i 'd like to see it in action..
i'd be in for one, too. No schematic yet...but is there the possibility of adding a LAG control, so you can turn a know, and delay the CV pulse from the MIDI clock, maybe even move it earlier? That'd be nice to sync a modular to a MIDI based system, and get notes to align tightly. Or better: make it CV controllable as well, so you can add groove to the beat by adding a gated S&H LFO to the input? Plus, videos get people's attention and might get them to ask for one. The parts aren't too expensive, so I'll build the full thing just in case I want to use the other functions in the future. Just let me know who to pay and give my address to once they are ready to sell. Am currently refurbishing the modular, so it'll have to be cobbled together for the demo. Work is frantic at the moment , so it might be a few days before it happens. As far as Lag and CV control go, I haven't thought about that so far. You've got access to the raw clocks via pin-headers on the board, so delaying them is easy. Moving them *forward* in time is also possible, by delaying the first beat to *just before* it would happen at the second beat.